Our Close Assault program this spring will honor our nation’s Vietnam Veterans… many of whom joined the Guard after their regular Army service. Remember the true meaning of Memorial Day with this back at the Vietnam War. Close Assault 1968 honors the service and sacrifice of America’s veterans. 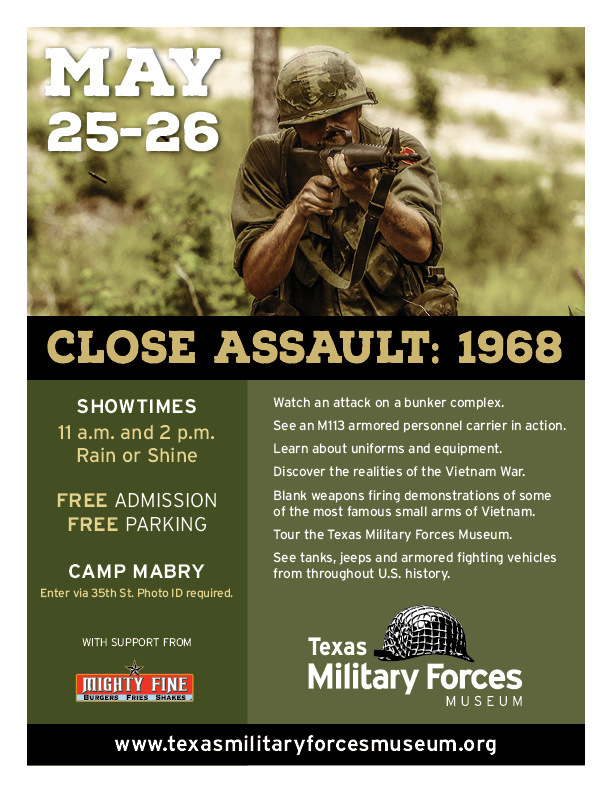 The free program features members of the Texas Military Forces Living History Detachment exhibiting the uniform and equipment worn by the American soldiers. In addition, the two-day event will provide guests the opportunity to witness firing demonstrations and watch an assault on a bunker with an M113. The event will take place RAIN or SHINE. Bleacher seating is available. Showtimes are at 11 am and 2 pm each day. The program runs for about 1.5 hours. The museum will be open 10-4 each day. Both the program and admission to the museum are FREE.